For many homeowners, when it comes time to renovate or remodel their home, eco-friendly choices are important. This is where recycled glass countertops enter the picture. They’re not just environmentally friendly; they are also attractive and strong. Recycled glass has a similar smooth appearance to that of polished granite. The recycled glass comes from many different sources, including glass from cars, drinking cups and old buildings. Environmentally Friendly. Recycled glass is one of the best environmental choices when it comes to eco-friendly decision-making in the kitchen. 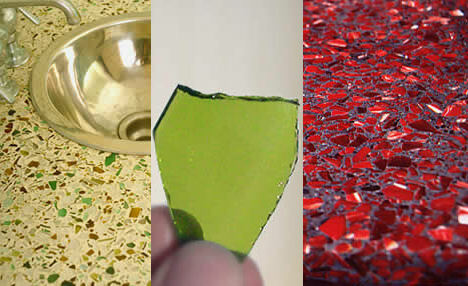 Recycled glass countertops often consist of over 85% glass (100% recycled), giving products a second life. It also means that the quarrying of natural granite countertops, often associated with unsustainable practice, isn’t undertaken. Tough. You wouldn’t think so, but recycled glass countertops are extremely durable. With a similar strength to that of granite, these countertops are far from what many imagine. They’re able to withstand hot objects and scratches from normal and abnormal kitchen activities. Range. There are a wide range of colors to consider when choosing recycled glass countertops. In fact, Vetrazzo are constantly changing their color range to keep up with new supplies of recycled glass. If not cared for properly, recycled glass countertops can stain. For optimal performance, these countertops should be resealed annually or once every two years. This, however, is as simple as putting the sealant on, leaving it to sit, and then taking it off again. Waxing also helps to protect the surface. Environmental choices are very popular throughout the home. Recycled glass countertops are just one such choice a homeowner can make. Don’t feel you need to miss out on durability and appearance if you purchase eco-friendly products. If thinking about installing recycled glass countertops in your Outer Banks home, why not come and see the team at Outer Banks Custom Kitchens. They carry the quality Vetrazzo brand of recycled glass countertops.